When a temporary sustainable growth rate (SGR) patch was passed in April 2014 for the 17th time, that short-term fix and the inclusion of the ICD-10 delay got the industry's attention. While the ICD-10 delay certainly merited the attention of health care providers, there are other provisions included in the Protecting Access to Medicare Act (PAMA) of 2014 that providers must pay attention to in order to prepare for the impending changes. Radiologists should also consider the importance and impact of two provisions: the mandate of appropriate use criteria and clinical decision support (CDS) tools when ordering advanced diagnostic studies and the promotion of patient safety in CT diagnostic imaging. PAMA included a mandate that beginning January 1, 2017, any physician ordering advanced diagnostic imaging exams must first consult Health and Human Services (HHS)-sanctioned appropriate use criteria. The law specifically states that the criteria must, to the extent feasible, be based on studies that are published and reviewable by stakeholders. HHS must publish the final accepted criteria by November 15, 2015, using evidence-based data collected from various provider-led organizations such as the ACR. Once finalized, ordering physicians must consult the criteria prior to ordering advanced imaging studies, which include CT, MRI, nuclear medicine, and PET. These consultations will not apply to inpatient services or those ordering practitioners who meet certain hardship criteria. Given the potential administrative burden this would put on ordering physicians, not to mention the radiology revenue cycle, the law also mandates that ordering physicians confirm the appropriate use criteria were consulted prior to the exam through the use of a CDS system. The law does not specify that the physician ordering the exam must adhere to the appropriate use criteria. Instead, the claim for the exam must be submitted with evidence that the criteria were consulted. Radiologists must take responsibility for the administrative aspects of the new workflow and tag each claim to show the ordering physician consulted the guidelines. In this regard, the mandate should ultimately reduce the number of medical necessity denials to the group. Because the law mandates that providers utilize CDS tools, HHS is also tasked with vetting the CDS tools and creating a process whereby CDS vendors can be deemed certified. If this sounds familiar, it is because the process is somewhat similar to the EHR certification process within the meaningful use program. By April 2016, HHS must publish qualified CDS mechanisms that ordering practitioners can consult. Compared with EHRs, this investment should be less substantial, even though providers are facing more monetary incentives for a financial investment in technology along with a significant potential impact to revenue for noncompliance. It is hoped that the cost of the CDS programs will not be prohibitive for providers. In fact, radiologists should expect to see an increase in claims efficiencies through reduced medical necessity denials, because CDS substantiates the exam ordered and theoretically cuts down on unnecessary testing. The new legislation also introduced provisions for patient safety in medical imaging that more strictly controls CT dosage requirements under National Electrical Manufacturers Association (NEMA) Standard XR-29-2013. 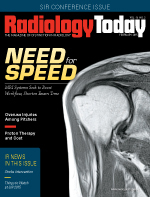 The standard identifies common CT system attributes that better optimize and manage doses of ionizing radiation while still enabling the system to deliver the diagnostic image quality needed by the physician. Specifically, the following HCPCS codes are subject to this regulation: 70450 to 70498, 71250 to 71275, 72125 to 72133, 72191 to 72194, 73200 to 73206, 73700 to 73706, 74150 to 74178, 74261 to 74263, and 75571 to 75574 (and any succeeding codes). Based on current estimates that suggest slightly more than one-third of the CT equipment being used today does not meet that standard, effective January 1, 2016, Medicare providers will have to ensure that the CT equipment they're operating meets the NEMA standard. For providers who continue to operate equipment that does not meet the standard, there will be progressive reductions in reimbursement, starting at 5% in 2016 and followed by 15% in 2017 and every subsequent year. If facilities determine that the replacement or upgrade of their units is too costly, as much as one-third of CT equipment could be leaving the marketplace and may present an imaging access issue to health care consumers. It should be noted the CT equipment rule applies not only to freestanding imaging centers but also to hospitals' outpatient imaging services. However, it does not apply to hospital inpatient services. Theoretically, the provision seems a viable way to reduce costs and improve care, but there will be financial impacts to radiology groups and imaging centers. The options for imaging providers may seem self-explanatory at first, but it is important that radiologists reassess their CT equipment. If an upgrade to meet the new standard is not possible, radiologists are advised to weigh the cost of a capital equipment investment vs the financial impact of decreased reimbursement relative to their patient volume. However, it will be equally important for an imaging center to operate equipment that delivers the least radiation exposure to patients for both patient safety and the risk of radiologists losing their share of the market. Along with appropriate use criteria mandates, operating CT equipment that meets the NEMA standard should be on the radar of every imaging center and radiology practice. The idea behind the federal program is to reduce unnecessary exams, radiation exposure to patients, and the cost of imaging in health care; the new legislation is setting guidelines for providers to be successful in each of those areas. The benefits should outweigh the costs to participate in these programs, and radiologists should focus on the important provisions most applicable to their practices. — Harry Purcell is an operations manager with Zotec Partners.